You may optionally download and print this GPA Donation Form and mail it along with your check or money order to the address listed on the form. The purpose of Greyhound Pets of America(GPA) is to find responsible loving homes for Greyhounds, to acquaint the public with the desirability of Greyhounds as pets, and to inform them of the availability of Greyhounds for adoption. 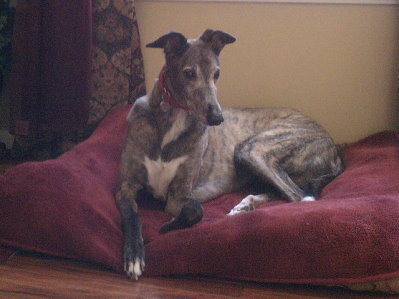 Greyhound Pets of America Greyhounds are primarily ex-athletes from various racetracks around the country. The breed is noted for being very gentle and non-confrontational. They are very adaptable upon adoption, and fit very well into all walks of life. Greyhound Pets of America was founded in 1987 to find homes for racing greyhounds when their racing careers were finished. Through the support of our volunteers and countless hours that they have given, GPA and its chapters have adopted over 80,000 greyhounds to homes throughout the country. "There is no immediate urgency to find homes for the canine athletes who will be dislocated in 2020," Goree said. "GPA has been working in the field of greyhound adoption for decades, and we know how to prepare for this planned transition out of live racing. When the time comes, all greyhounds will be adopted or returned to their owners," he said. Goree said GPA's network includes many of the national organization's state and regional affiliates, and also includes numerous non-GPA groups. "Animal welfare is always top priority for the greyhound adoption groups. GPA National spearheaded the placement of greyhounds from other track closures in Massachusetts, Arizona, and Tampa Greyhound Park, which suspended live racing in 2007. The track still operates a simulcast facility and poker room. GPA Tampa Bay aided the Tampa track in pet placement. That chapter has been the official greyhound adoption agency for historic Derby Lane for over two decades in St. Petersburg FL and will play an even bigger role in the future." "We appreciate the many people who have called and emailed us offering to take greyhounds," Goree noted, "but the majority of these greyhounds will continue to race for the next two years, so there's no crisis here." He said that GPA and cooperating adoption groups have well-developed systems in place to track every greyhound and to screen prospective greyhound adopters. Goree challenged the animal rights groups that promoted Amendment 13 to shift their energy from creating public hysteria to supporting the greyhound adoption effort. "These groups are very quick to take credit for closing these tracks, but we have yet to see even one of them contribute financially to the massive relocation effort that will be necessary in 2020," he concluded. For all media inquiries, please email: info@greyhoundpets.org. All future updates will be presented on the GPA National Facebook page, which can be accessed via the feed below. Visit our YouTube Channel to find videos about our Chapters and our Greyhounds. You'll find videos containing everything from featured chapters, transport videos, and just about anything "Greyhound."